Recently, we were delivered an exciting piece of news, Halo: Escalation to follow the Halo Wars storyline in a way, now, we have details to run off of with a cover and description! The base information and image come from ComicBookResources.com, who listed multiple upcoming Dark Horse titles. Starting off with the cover, it is noticeable that this is a Forerunner world, surprisingly enough looking much more dense and valley-like compared to Requiem which was overloaded with metal buildings and constructs, this seems to be more of an isolated plain, but one construct is still noticeable with the typical forerunner silver and blue. The area actually hearkens back to Forge World from Halo: Reach, oddly enough, it looks nearly exactly the same! We can clearly see Thorne and three squadmates observing the valley. Majestic team was composted of five members, and we know that one particular squadmate was killed in action, so one squadmate, likely Thorne, took over the team. The warthog is included in the shot, and for the first time we see a Halo 4 era Turret-less warthog have a main feature in the story somehow. In the reflection of the front visor, we can clearly see more silver and metallic structures, as well as some form of floating debris. Oddly enough in the backdrop you can make out what looks like more continents floating above, as the outline is thicker then that of a cloud, similar to the Halo 5 trailer where whole planets could be seen from the landscape. The most odd feature of the image is what looks like Forerunner cruisers ascending from the ground, three to be exact. Their appearance looks oddly similar to the Promethean Turrets fought in-game, without the orange details coursing through the sides. Could this be an indication of a sort of Allied Promethean group in the next Halo? The original blue Promethean Soldiers only fought the Chief because their function was to keep anyone attempting to awake the Didact out. Since these were Librarian Prometheans, and the Librarian does side with the Chief, could we see allies within the Prometheans in later titles? Next, the description. It clearly states that New Phoenix, which had the entire population exterminated at the end of Halo 4, has been opened up and now Thorne will be going in to investigate. Two interesting pieces that go along with each other here are, "what it has to do with the Master Chief," and, "An essential addition to the Halo canon!" These lines signal that this will have an effect on John's journey in Halo: Xbox One, and that it will be essential to Halo's canon story. Of course, this could be marketing strategies and not anything large at all, but previous escalation comics have shown this to be false with the death of a member of Majestic, as this has a major effect on Majestic's role in the story. So taking all of that in, would you enjoy fighting alongside the Prometheans or rather keep them as enemies? Credits to Brett for pointing out this article to me! As reported in Comic Book Resources the Halo comic book series will continue in Halo:Initiation by DarkHorse comics. featuring Sarah Palmer. This new series will be written by Halo 4 writer Brain Reed, who also adapted the Halo:Fall of Reach into a comic book series for Marvel, and feature the artwork of Marco Castiello (shown below from Wired) and take a deeper look into the Spartan-IV program. 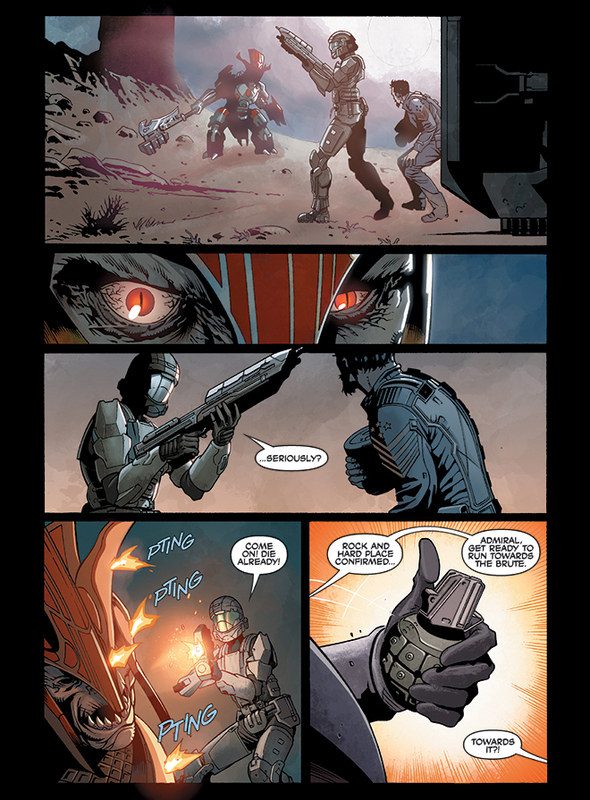 Spartan OPs may have left fans wanting to know more and Dark Horse will release the new series of comics in mid August. Dark Horse continues in the tradition of bringing only the biggest and best characters and story lines to comics with the announcement of the Halo: Initiation miniseries, launching in August! This exciting new miniseries will be written by Halo 4 writer and comics veteran Brian Reed, with art by Marco Castiello (Secret Invasion: Front Line, Star Wars: Purge)! Before she was a supersoldier defending humanity as part of the Spartan-IV program, Sarah Palmer was an ODST—Orbital Drop Shock Trooper—carrying out the most dangerous missions behind enemy lines! 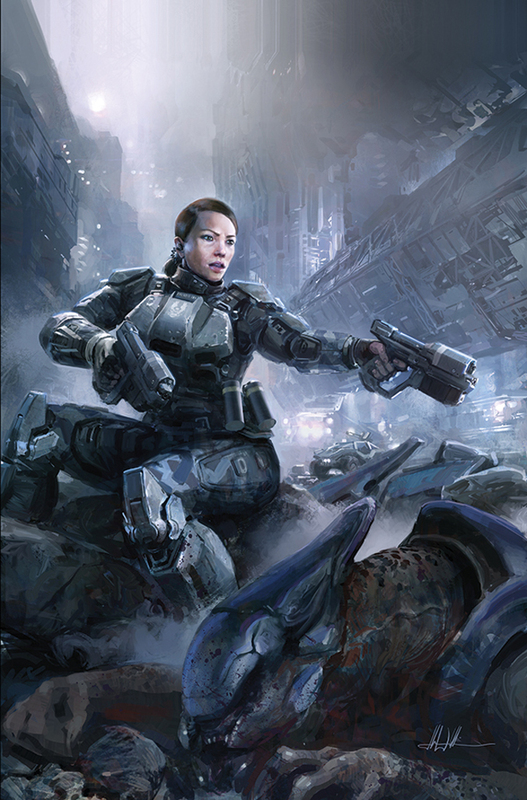 See how she became the first Spartan-IV commander in this must-read series for fans of Halo 4 and the Halo franchise! "A rich science fiction universe driven by compelling characters, Halo has all the makings for show-stopping comics, " said Dave Marshall, Dark Horse Editor. "In Initiation, Brian and Marco are delivering an action-packed thrill-ride with a beating heart of authentic human drama." “It’s really exciting to work with Dark Horse in continuing the Halo story in comics. After Halo 4 and Spartan Ops, fans wanted to know more about the origins of the Spartan-IV program and Sarah Palmer in particular. So it’s great fun to be able to grant those wishes with a partner like Dark Horse,” said writer Brian Reed. Founded in 1986 by Mike Richardson, Dark Horse Comics has proven to be a solid example of how integrity and innovation can help broaden a unique storytelling medium and establish a small, homegrown company as an industry giant. The company is known for the progressive and creator-friendly atmosphere it provides for writers and artists. In addition to publishing comics from top talent such as Frank Miller, Mike Mignola, Neil Gaiman, Brian Wood, Gerard Way, Felicia Day, and Guillermo del Toro, and comics legends such as Will Eisner, Neal Adams, and Jim Steranko, Dark Horse has developed its own successful properties, including The Mask, Ghost, Timecop, and SpyBoy. Its successful line of comics and products based on popular properties includes Star Wars, Mass Effect, Buffy the Vampire Slayer,Aliens, Conan, Halo, Avatar: The Last Airbender, Serenity, Game of Thrones, and Domo. Today Dark Horse Comics is the largest independent comic book publisher in the US and is recognized as one of the world’s leading publishers of both creator-owned content and licensed comics material.